Imagine hosting your family and friends around a lovely, outdoor fireplace. You don't just have to imagine though, you can have the Empire OLL60FP12SN Carol Rose Outdoor Stainless Steel Linear Fireplace sitting in your backyard today. 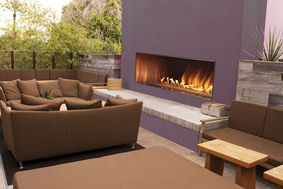 Manufactured with stainless steel, this fireplace can withstand the outdoor elements to bring you warmth. It is a see-through linear fireplace, operating at 70,000 BTU, with a modern, elegant design. Light up your fireplace with the pushbutton manual ignition. This 60-inch fireplace operates effectively and efficiently. With beauty, quality, and ease of operation, you can thoroughly enjoy your outdoor fireplace with those you open your home to. Is this a vented fireplace? This is a vent-free fireplace. Do you get everything you see in the picture of this Empire fireplace or is just a fire box? This item is the fireplace only, with all of it's standard equipment. It is shown built into a surround as a design suggestion.